Heat olive oil in a large pot over medium heat. Sauté the chicken until mostly cooked. Cook onions and garlic until soft. Add chopped red, green, and chili peppers. Sprinkle with half measurements of the above-mentioned seasonings. 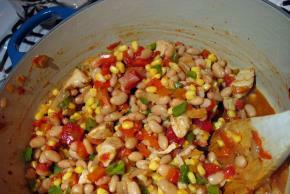 Gently stir in the diced tomatoes, white beans, and frozen corn until well mixed. Sprinkle with remaining seasoning. Cover and cook on medium heat for five minutes. Pour in the chicken broth. Cover and simmer for 15 minutes, stirring every few minutes. After 15 minutes, stir in the crushed tortilla chips, cover and let simmer for 10 minutes. Lastly, fold in the shredded Mexican cheese. Have a taste, and add as much spice as desired.